We are a North Carolina Bridal Boutique with sample designer wedding gowns from all over the world. Our dresses will fit size 2-32. 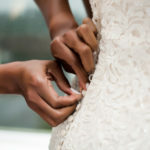 Our bridal stylists are committed to personalized service and attention to detail, giving our brides the very best experience. To ensure exceptional service we operate by Appointment Only. Want to pop in? Give us a call ahead of your visit to have a stylist ready to meet you with champagne in hand!